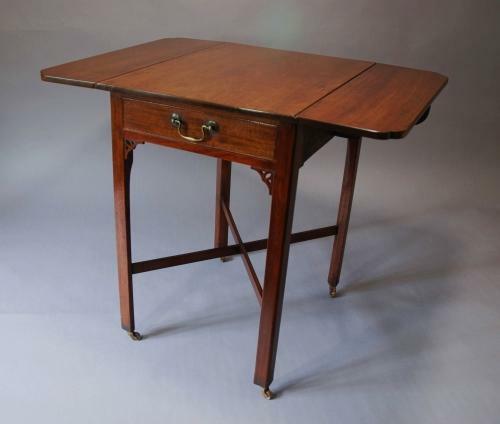 This table consists of a solid mahogany top with two leaves, each with re-entrant corners leading down to a long drawer being oak lined with a swan neck brass handle. The table stands on four square legs on brass casters, the legs being chamfered on the back and having a pierced bracket to the top of each leg supporting the drawer rail, an X stretcher gives additional support to the four legs. This table is in very good condition, is of stable construction and can go straight into a home.